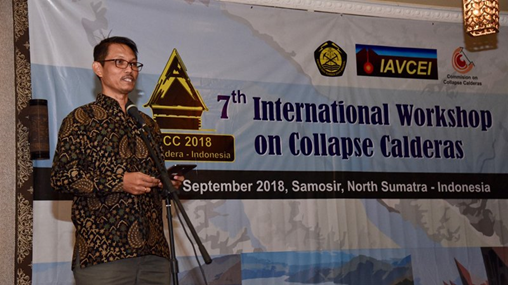 SAMOSIR - Secretary of the Geological Agency of the Ministry of Energy and Mineral Resources (ESDM), Antonius Ratdomopurbo officially opened the 7th International Workshop on the Collapse of the Caldera, (The 7th International Workshop on Collapsed Calderas). Present at the event were Head of Volcanology and Geological Disaster Mitigation, Kasbani, Regent of Samosir, Rapidin Simbolon, Vice President of the International Association on Volcanology and Chemistry of Earth Interior (IAVCEI) Prof. Shanaka de Silva and Secretary of IAVCEI Prof. Roberto Sulpizio. According to Purbo, gathering volcanologists and geoscientists from various parts of the world in this event was a happy matter for us, the Geological Agency of the Ministry of Energy and Mineral Resources, because this event was in accordance with the task of the Geology Agency, one of which was conducting research and mapping inventory of geological heritage objects. and provide recommendations for areas that have the potential to become geo park areas that make geological conservation sustainable. Toba events super eruptions have become a major event in the history of the Earth. In the next few days 69 experts and researchers in the field of geology and volcanoes from within and outside the country will discuss it in detail so that it is expected to benefit those present as well as the Regional Government. "We will learn about all the geological aspects of Toba Caldera. I hope this workshop will be a good place for discussion and knowledge sharing. Some of the programs in this meeting not only benefit the scientific community, but also provide many benefits to the government and local communities. In addition, Toba Caldera has become a natural laboratory. I hope research collaboration and scientific networks can be realized in the future, "said Purbo. Samosir Regent, Rapidin Simbolon welcomed the implementation of this event, the selection of Samosir Island for this event was right because the Toba Caldera was very unique. The caldera was formed by three eruptions from super volcanoes. The last eruption was very large and extraordinary which affected the climate and ecosystem on Earth at that time. This makes Lake Toba as one of the largest caldera in the world which is 62 miles long, 19 miles wide and up to 505 meters high. 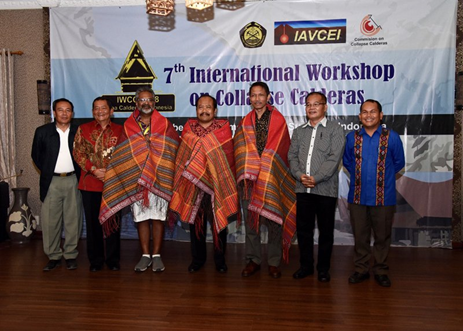 "We are optimistic that as an object of the workshop, the Toba Caldera will be able to increase our understanding and knowledge about the collapse of the caldera. Therefore, we hope the results of this scientific activity will produce useful recommendations for the seven districts around Toba Caldera, especially Samosir who has many interesting places to study, "said Rapidin.